The official game of the annual Yu-Gi-Oh! 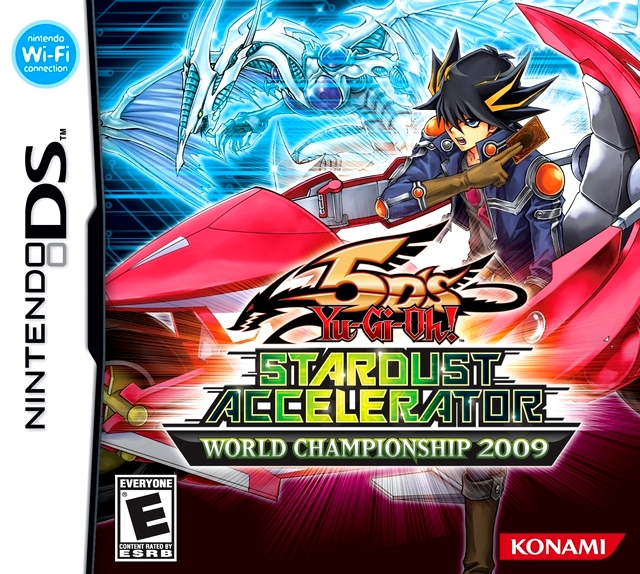 World Championship Tournament, the DS title offers a stunning simulation of the Trading Card Game, with users constructing, organizing and dueling using the stylus. Every aspect of the Trading Card Game has been faithfully recreated, and the DS game includes all of the latest cards, allowing for even more attacking, spell-casting and defending possibilities. Yu-Gi-Oh! 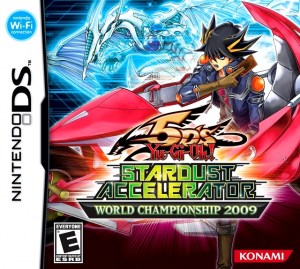 5D’s Stardust Accelerator — World Championship 2009 for the Nintendo DS will be released during Q2 2009. This is the first game based on the new Yu-Gi-Oh! 5D’s TV show and allows up to four players to compete within two distinctly different ways, either Story Mode or through 2009’s Yu-Gi-Oh! World Championship. The game features an enhanced dueling system, larger card images and more cards than ever before, with 2500 in total. Stardust Accelerator includes three promotional cards, which are used by Kalin in the Yu-Gi-Oh! 5D’s anime. These include: “Infernity Guardian”, “Infernity Archfiend” and “Infernity Dwarf”. The Korean version of the game included 7 promotional cards; the said 3 along with the cards from Limited Edition 12; “Light End Dragon”, “Dark End Dragon”, “Chaos-End Master” and “Sphere of Chaos”. The player wakes up in Satellite, stripped of their memory. They are found by Rally who duels them in the hopes it will help them regain their memory. Rally introduces them to his friends Blitz, Nervin and Tank and takes the player to their base in the Satellite underground. The player finds a “Speed Spell” card in their Duel Disk, causing everyone to believe that they are a Turbo Duelist. 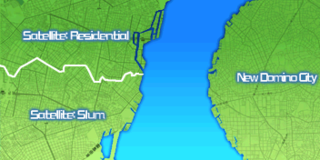 Since Yusei and Sector Security are the only Turbo Duelists in Satellite, they figure the player is from the City. Since a Turbo Duelist is not complete without their Duel Runner, Blitz arranges for the player to buy a Duel Runner from Kuroe. After discovering it has no engine or CPU, Blitz goes to confront Kuroe, but ends up getting kidnapped. The player then ventures to the thugs’ lair, where they duel and defeat multiple thugs in order to free Blitz. After saving Blitz, Yusei gives the player a spare engine to use in their Duel Runner, before he leaves for New Domino City. A few days later, Rally gives the player a CPU. With the Duel Runner complete the player takes it for a test run. A group of securities, led by Officer Trudge appear outside the group’s lair, accusing Rally of stealing the CPU. Since they were using the signal from Rally’s criminal mark to trace their location, Blitz used Yusei’s jamming device to block the signal. The group split-up; Rally, Nervin, Blitz and Tank go one way and advise the player to ride their Duel Runner to the Old Highway. The player races out past the Securities, prompting Trudge to chase them. After the player outruns Trudge, they come back to the hideout. The player is planning to escape through the pipeline just like Yusei did earlier in the game. After beating a test simulation, the player gets a chance to escape to New Domino. As the player enters the pipeline, Trudge immediately follows in pursuit. After outrunning him, the player gets caught by Security and is taken to the detention center having their Duel Runner and Deck confiscated. In jail, the player reaches the Recreation room where Bolt Tanner is. Tanner has just won a Duel, with his opponent lying on the floor. Tanner taunts the defeated duelist by calling his cards trash, and the player then attempts to defend the defeated duelist by dueling Tanner with his Deck (like Yusei uses Yanagi’s Deck in the anime). After beating Tanner, the player notices Yusei also getting escorted to his cell, and then receives a challenge from Mr. Armstrong. So the player has to collect cards from the inmates to create a Deck and use it to beat him. After beating Armstrong, Armstrong calls off the deal and orders the Securities to seize the player. However, he is interrupted when Rex Goodwin appears on the scene, firing Armstrong and eventually releasing the player into New Domino City. Tanner passes the player his Ushi Oni card, telling them to seek a bar named Bootleg. Showing the card will allow for the player to come into contact with an acquaintance. Upon arriving at the Bootleg, the player shows the bartender Tanner’s card, but the bartender requests that the player complete some of his Duel Puzzles, as he’s a Duelist. After completing 3 Puzzles, the bartender tells the player to wait outside – and upon exiting the bar, they encounter Blister, who escorts them to his hideout. The player informs Blister of the plan to reclaim the Duel Runner and Deck. After some time of thinking, Blister gives the player a fake Security ID and Security uniform so that the player can sneak into the Security Impound Center and get their Deck and Duel Runner back. After sneaking past the guards and getting to the Duel Runner, the player is once again cornered by Trudge. The player then gets on the Duel Runner and promptly outruns Trudge once again through the Impound Center. Upon escape, the player encounters Yusei, who also has reclaimed his Duel Runner and Deck. They both make a break to whatever cover they could find. As the player escapes Trudge they are guided by Leo to a place where they could hide out for the time being. Leo introduces himself and Luna, and then challenges the player to a duel. Upon winning, the player gets let in on a secret: there is an underground duel arena. At the duel arena, the player and the twins witness Akiza beat yet another duelist. While people flee from the arena, the player feels a stinging pain as they notice a birthmark appear on their arm. Akiza notices this mark and promptly challenges the player to a Duel. After the player wins, the birthmark disappears. Several days later, the player gets informed of a Tag-Team Duel Tournament as they make their way towards the Duel Runner Shop. They also get into a Tag Duel with the twins, with Blister as their temporary partner. After the player finds a partner, they proceeds to the Duel Stadium where they proceed through the tournament, facing Figaro and Corse (this opponent team may vary between who’s chosen as the Tag partner), Blister and Tanner, and finally Leo and Luna. After winning, the player runs into Goodwin, who congratulates the player for their victory. Some time later, the player runs into Tanner outside the bar and receives an invitation to the Fortune Cup. They shows this to Blister to know more about it, and is told to go to the Neo Domino Highway so as to sign up for the preliminary race. After passing the preliminary race, the player is confronted by Bass who then shows them how to play a Turbo Duel. After that, the player is also informed of the Speed Spells being sold at the shop. The player then proceeds to the Duel Stadium where they face off against Trudge, Hunter Pace, and Greiger in the three Turbo Duels of the preliminaries. Following this, the player proceeds into the latter half of the Fortune Cup, facing off against Gill Randsborg and Akiza in two ground duels, and squaring off with Yusei in a Turbo Duel. Upon finishing the duel, the player is about to prepare for the final duel with Jack Atlas, when they black out. They receive several flashbacks, and they wake up at a temple for the People of the Stars. They are then confronted by Rex Goodwin. It is revealed to the player that he was the one who grafted the birthmark onto the player’s arm, as Goodwin plans to utilize the power of the Crimson Dragon. Goodwin then pits the player against 4 other clones – Alpha, Beta, Gamma and Delta – and the player has to defeat all 4 of them without replenishing life points in between duels (You’ll just have to do the match over again). Upon victory, the Crimson Dragon appears, but then shortly dissipates. Goodwin then realizes that he cannot simply do with replicas, despite the fact that intense duels will lead to the awakening of the Crimson Dragon. The player then blacks out again, and finds themselves back in their room, before the final duel with Jack Atlas. After defeating Jack, the player receives the Stardust Dragon card for Yusei. Goodwin aborts his plan to awaken the Dragon, and allows the player to do as they wish. 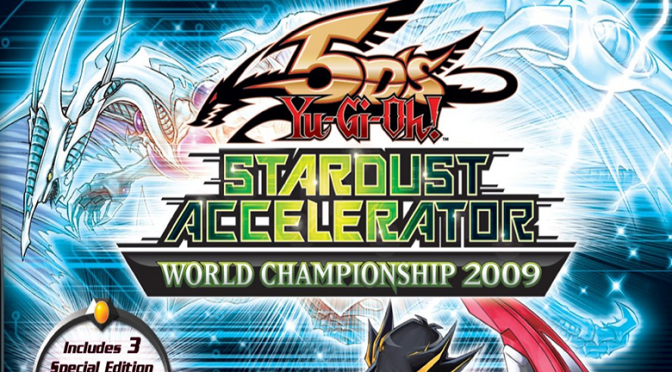 The player then passes Yusei the Stardust Dragon card, and also receives a Travel Permit, allowing them to travel between Satellite and New Domino City. Post storyline, Yusei has a new Deck with “/Assault Mode” support, the name of which references the game title, XLerator. The player creates their own character. They choose their name, gender and appearance. Story Mode includes the majority of characters from the first arc of the anime and a number of original characters. Additional character versions of cards can be unlocked as opponents and Tag Duelists in Free Duel mode. You can also unlock opponents for Free Duel in World Championship Mode by advancing the plot or defeating opponents in Story Mode (5 times per opponent). Certain opponents can only be unlocked for accomplishing tasks like summoning a difficult-to-summon monster, or winning with a special victory condition. Note that they must be done in a regular Duel; Duel Puzzles don’t count. Acquiring enough opponents within a certain skill level will unlock Tournament Mode for a certain Level. In Tournament Mode, the player enters a 3-tier elimination tournament with 7 other randomly chosen available CPU opponents, and must defeat the three opponents they get matched up with in separate duels in order to win. Clearing Tournament levels are required to unlock certain opponents and packs. Ultimate Insect LV7 – Special Summon Perfectly Ultimate Great Moth. Exodius the Ultimate Forbidden Lord – Win using Exodius’ victory condition. Montage Dragon – Clear all 5 of the Bootleg owner’s Puzzles. Jinzo – Lord – Activate a total of 500 Traps. Arcana Force EX – The Dark Ruler – Special Summon its corresponding card. Vennominaga the Deity of Poisonous Snakes – Win using Vennominaga’s victory condition. Evil HERO Infernal Gainer – Reach 50 hours of play time. Destiny End Dragoon – Special Summon Destiny HERO – Plasma. Yubel (character) – Special Summon Yubel – The Ultimate Nightmare. Stardust Dragon/Assault Mode – Special Summon its corresponding card. Brionac, Dragon of the Ice Barrier – Synchro Summon a total of 200 times. Ultimate Ancient Gear Golem – Special Summon its corresponding card. Blue-Eyes White Dragon – Fusion Summon Blue-Eyes Ultimate Dragon. Colossal Fighter – Purchase all Duel Runner Shields. Alien Overlord – Purchase all Duel Runner side parts. Doom Dozer – Purchase all Duel Runner speed boosters. Evil HERO Dark Gaia – Activate a total of 300 Speed Spells. Light and Darkness Dragon – Reach 100 hours of play time. Horus the Black Flame Dragon LV8 – Activate a total of 750 Spells. Endymion, the Master Magician – Beat all levels of Single Tournament Mode at least once. Dark Armed Dragon – Special Summon Armed Dragon LV10. Judgment Dragon – Special Summon a total of 1000 times. Gladiator Beast Gyzarus – Special Summon Gladiator Beast Heraklinos. Beast King Barbaros – Reach 200 hours of play time. Spirit Reaper and Dark Necrofear – Win using Destiny Board’s effect. Ruin, Queen of Oblivion and Demise, King of Armageddon – Win using Final Countdown’s effect. Exodia the Forbidden One and Tragoedia – Win using Exodia’s victory condition. Cyber Dragon and Drillroid – Special Summon Super Vehicroid Jumbo Drill. Ultimate Tyranno and Super Conductor Tyranno – Tag Duel a total of 200 times. Cosmic Fortress Gol’gar and Vennominaga the Deity of Poisonous Snakes – Win using Vennominaga’s victory condition. Abyss Soldier and Ocean Dragon Lord – Neo-Daedalus – Have at least 10,000 DP at one time. Summoned Skull and Splendid Venus – Beat Tag Tournament Mode at least 5 times. Five-Headed Dragon and Cyberdark Dragon – Special Summon Five-Headed Dragon. Destiny HERO – Doom Lord and Elemental HERO Stratos – Turbo Duel a total of 100 times. Dark Armed Dragon and Caius the Shadow Monarch – Beat Tag Tournament Mode at least 3 times. Cyber End Dragon and Chimeratech Overdragon – Have a monster you control reach 20,000 or more ATK. Flamvell Baby and Medium of the Ice Barrier – Tag Duel a total of 150 times. Kasha and Rainbow Dark Dragon – Special Summon Rainbow Dark Dragon. Batteryman Charger and Thunder King Rai-Oh – Beat 10 Tag Teams in World Championship Mode at least 5 times each. Horus the Black Flame Dragon LV8 and Silent Swordsman LV5 – Beat 20 Tag Teams in World Championship Mode at least 5 times each. Simorgh, Bird of Divinity and Simorgh, Bird of Ancestry – Tag Duel a total of 50 times. Soldier of Mist Valley and Red Dragon Archfiend/Assault Mode – Special Summon Red Dragon Archfiend/Assault Mode. D.D. Survivor and Raiza the Storm Monarch – Turbo Duel a total of 200 times. If the player’s character is a girl, many of the other main characters will refer to her as a “he” and Rex Goodwin introduces the clones as the player’s “brothers” instead of “sisters”. When interacting with Elgio, a player may find ‘Turbo Duel’ instead of ‘Tag Duel’. Activating ‘Turbo Duel’ causes the player and their teammate to tag duel against Elgio and Itokawa. Occasionally part of the character model’s hair may turn white unnaturally. In extreme cases, almost all of the hair is white. This is a minor texture glitch and shouldn’t harm gameplay. Once all of the Structure Decks have been bought, the only one available will be the 5D’s Starter Deck, and the player will not be allowed to buy any others (the 5D’s Starter Deck will also have the ‘new’ symbol above it). Additionally, every time the player leaves the card shop, the game will say that a new pack has been added to the card list, when actually, nothing happens. This does not affect any aspects of gameplay, however. When “Canyon” is in play and you attack a Rock-Type monster in Defense Position with a monster that inflicts piercing damage and win, the damage to the opponent is doubled, even though the lore says that damage will only be doubled for the controller of the attacking monster. When in the Tournament or playing on-line sometimes, the monster attack sound effects will be swapped with the attack sound effect of the attacked monster. For example, when a monster with a laser sound effect attacks a monster with a sword/slash sound effect, you will hear the sword/slash effect. If an Action Replay is used, if you are attacking a monster which is about to be destroyed due to your monster having more attack points, the last 0 in the difference between attack points appears before all of the other digits. This can also happen if you are not using an Action Replay occasionally. When an “important” monster that has its own intro (e.g. Dark Armed Dragon, Tytannial, Egyptian God Cards, Great Shogun Shien, Light and Darkness Dragon, …) is summoned, its intro’s music is skipped every now and then. In the English anime, Nervin and Blitz have their names swapped, but not in the game. Sometimes, the game sound is heard as double, microphones failure. Despite not mentioning it in either OCG or TCG text, some Plant support cards in the game only affects Plants on your side of the field, even though in reality they can affect both sides. Some Quick-Play Spell Cards can only be activated during the opponent’s turn. Sometimes when an opponent activates the effect of “Roulette Barrel”, they will destroy “Roulette Barrel” when they don’t roll a four. In Deck Construction, when using ‘Related Cards’ for “Lyla, Lightsworn Sorceress”, “Ryko, Lightsworn Hunter” will not appear. “Royal Oppression” can be used to negate and destroy “Blackwing – Gale the Whirlwind” when it uses its ATK-halving effect, even if it was Normal Summoned. When you attack with “Moai Interceptor Cannons”, the animation shows “The Statue of Easter Island” instead. When the effect of “Ryko, Lightsworn Hunter” activates, the option to activate its effect says “Do you want to destroy this card?” although, if you select yes, it wont destroy “Ryko, Lightsworn Hunter” and it will let you select the card to destroy, as it should. Using DS Wireless Communications to connect with the Wii Game, Yu-Gi-Oh! 5D’s Wheelie Breakers unlocks Speed Spell – Wheelie Breaker for use in Turbo Duels if you haven’t obtained it yet.